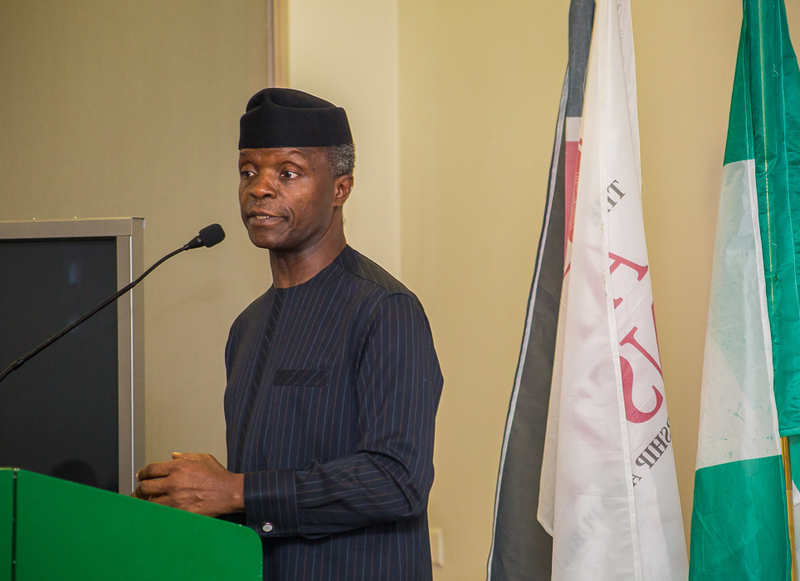 REMARKS BY HIS EXCELLENCY, PROF. YEMI OSINBAJO, VICE PRESIDENT OF THE FEDERAL REPUBLIC OF NIGERIA, AT 1ST CALESTOUS JUMA INNOVATION COLLOQUIUM HELD IN LAGOS ON THE 11TH OF APRIL, 2019. This century has been described as the Africa Century. This may mean different things to different people. But one clear notion that is captured in that description is that Africa is the continent with the greatest material challenges and also the continent with the greatest opportunities and potentials. Take population, for example, I’ve heard repeatedly how it is that we will by 2035, have 1.2billion people. Nigeria, its most populous country, will become the 4th most populous in the world. Over 50% of that number will be young persons, some would even put that at up to 60%, under the age of 25. Today 60 percent of the unemployed in Africa are young people. So, the implications for social upheaval are clear and we see them practically every day. Climate change poses special concerns, especially desertification, the drying up of the Lake Chad, for example, has had incredible implications for security in that area, of course, in the lives and livelihood of so many who live around it. The Lake Chad used to be about 35,000 square kilometres, today it is 1,500 square kilometre and of course, there are implications of that for those who depend on it for their lives or their livelihood. The challenges of healthcare delivery and education for a large population have also led to the worst human development indices in the world. Our continent has some of the worst of those indices. But these challenges have peaked in my view, at an auspicious time. A time when technology and innovation have begun to disrupt older and slower ways of achieving results. And for Africa, a time when its young innovators, Digital Scientists and Creatives, have emerged with such resourcefulness and creativity. There is no question that Africa’s future will be determined by innovation. With innovation and technology, Africa will skip or leapfrog over many phases of development, certainly those that other continents and other societies have had to go through. Let me illustrate very quickly with an example. We are all familiar, of course, with the success of the mobile phone in Africa. And I think we all understand there was no other path anyway, to reproduce the fixed-line telephony system of 1950s-1980s. This is what developed nations had to do and we simply skipped that phase and we found ourselves very quickly, in the mobile telephone era. But on the back of mobile phones have come some of those with remarkable leaps for example; mobile financial transactions, payments, wallets and all of those very interesting innovations that would require the whole infrastructure of banks and other forms of infrastructure just to make them happy. So today, mobile telephony has opened up businesses in rural areas in Kenya, Zimbabwe and Nigeria and led to greater financial inclusion and wealth creation. The birth of some of the exceptionally successful Fintech companies, some I’m told will be speaking to us today, have been on the back of mobile telephony. And the Federal Government has used mobile telephony to great effect, especially in the area of deepening Microcredits in the rural areas. We’ve given about 2.4million microcredit loans to people, especially those at the bottom of the pyramid in several rural areas. And this has always been on the back of mobile payments of one sort or the other. It would have been impossible or far too expensive, far too costly had we had to go another route. Also, consider healthcare and what countries have had to go through. The desired ratio of patients we’re told is perhaps 500-1 physician, 1 physician to 500. To reach this ratio would have required 400,000 physicians today in Nigeria. When we are going to be 300 million people, soon it would require another 600,000 to 700,000. Even if we were not haemorrhaging physicians to other countries, to create these numbers of physicians is may be difficult, but not impossible. 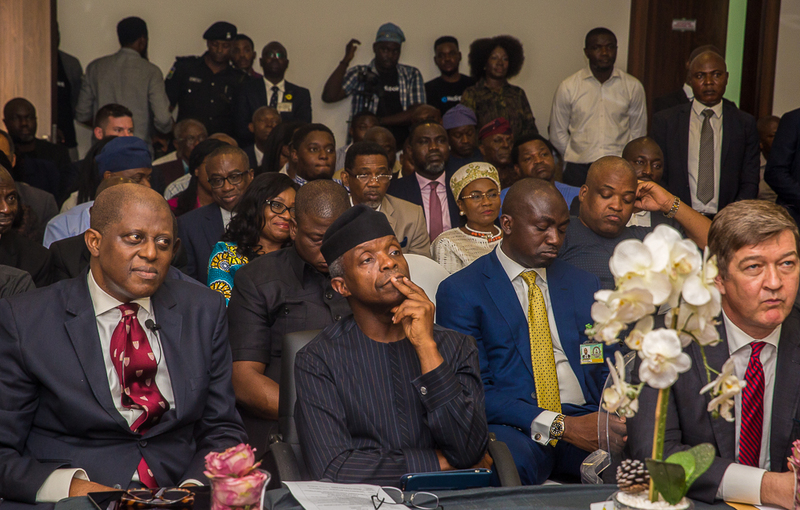 The only way we will be able to deliver quality healthcare to Nigerians is through a system where skilled people are augmented with intelligent innovation and technology, including telemedicine, remote sensing and artificial intelligence. Today we have indigenous companies in Nigeria and Rwanda delivering blood to hospitals using drones. In medical care, we are also seeing remarkable innovation. There is a 28-year-old Cameroonian, Arthur Zang, was also featured on the CNN innovation Programme, who invented a touchscreen heart-monitoring tablet called the Cardio Pad that has the potential to revolutionize medicine, especially in remote areas. The Cardio Pad provides access to healthcare for heart patients in remote areas without taking the long journeys to the cities where the heart specialists are located. So, the tablet is equipped with four electrodes that can be attached to the patient’s chest to determine whether their heart is functioning normally or not. The data is then wirelessly transmitted to the Cardio Pad tablet and sent to a cardiologist who can interpret it and make all of the necessary prescriptions. Similarly, a Nigerian, Osh Agabi, was also featured on the CNN programme. Agabi created a device that can detect cancer cells and even explosives. So, the system merges synthetic neurobiology with its traditional silicon technology. With the growing threats of security globally, this could prove to be revolutionary. But for me, perhaps the most remarkable innovation in the healthcare sector is that of the work being done by our Innovation Hub in Yola, Adamawa State; the Northeast Humanitarian Innovation Hub. Just last week, a group of interns designed, printed and assembled a 3-D printed prosthesis limb for an Assistant Superintendent of Police, Mr Tumba James who lost his arm while on active duty, that was just last week. The interns, Bashir Yau, Sulaiman Habib Adam and Kabiru Adamu and their colleagues, were trained in Yola and worked with a number of volunteers with amputated limbs. The equipment and materials required for the process are all in Yola. And all the work was done in Yola. So, there is so much opportunity and so much that’s being done. I could just go on and on. Food security is also a great area of need for us in Africa and of course, Nigeria. We can only feed our huge populations with improved productivity from our tens of millions of farmers in Nigeria. But this will require access to inputs, but also to accurate information about what to plant, when to plant, and how to cultivate. So geospatial and satellite data and access to mechanization on an as needed basis will be crucial. Also, we are going to need all manner of new ways of increasing productivity. I have 3 or 4 examples of that, but I’ll just take one. Angel Adelaja, I’m sure all of us are very familiar with her; she was also recently featured on BBC World Hacks. She runs a farm called Fresh Direct. The farm uses stacked containers with a focus on supplying premium organic vegetables using hydroponics and vertical farming technology. So, Angela is solving the problems of traditional farming using technology and bringing solutions to people’s doorsteps. Modular farming for African cities. So, as I said, there are so many different examples of what people are doing especially in the area of technology. And many of these young people have done so much, just in terms of creating disruptive technology in the agricultural sector in particular. It is also clear that the power problems we have will be solved by multiples of disruptive innovations. The days of the traditional model, a large grid fed by large power stations, are undoubtedly numbered. The smarter and more scalable options are using renewable sources of power; solar, wind, biomass, and waste to power. And the possibilities are limitless. 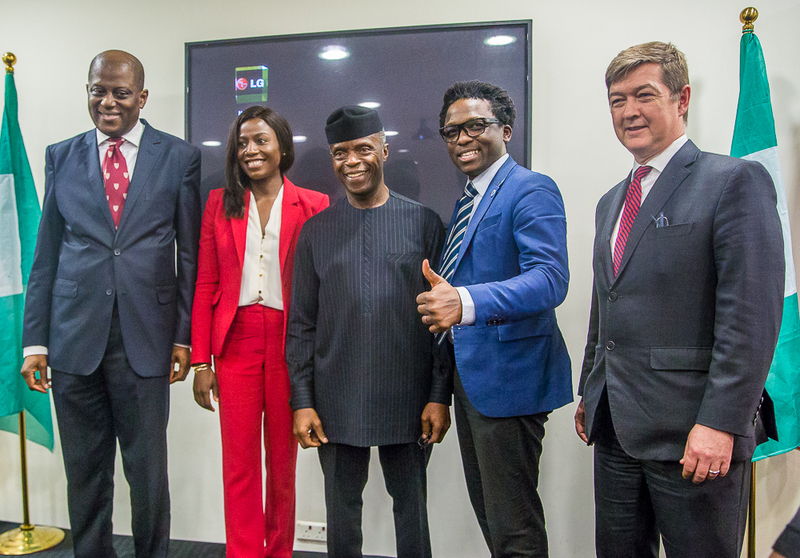 Recently at the Nigeria Climate Innovation Center, which is another innovation center backed by the Federal Government, located at the LBS (Lagos Business School), they recently concluded their Climate Launch Pad, and some very innovative ideas were unveiled. One of them, an innovation company called New Digits, generates power from water; the product uses water and conformed solar cells to generate energy for electricity and cooking. So, it works by collecting water automatically from any piping channel in the house, breaks down the water into Hydrogen which is used to cook and to power the entire house without need for batteries. They have the Power Stove Energy, founded by Okey, Abdulaezze and Glory; they produce low-cost, clean smokeless cooking stove. Powerstove Energy is the first clean cookstove to be fitted with self-powered cloud system to monitor in real time, a single day of cooking. And any amount of Co2 and biomass is saved, black carbon prevented and total electricity generated. Certainly, Africa is leading the way in a new way of thinking, as innovators figure out how to produce power in situ; new storage technologies also mean power is going to be portable for Africans. 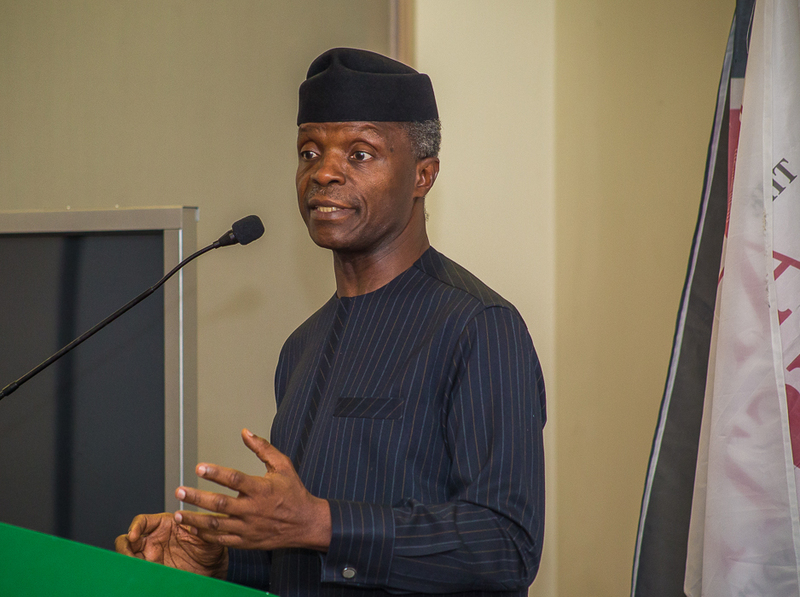 Of Nigeria’s 180 million people, over 20 million households have no power at all. As part of efforts to diversify power sources in order to improve access, we started a programme of providing solar power in 20,000 homes in rural villages. We started that project in a village called Wuna, we now have them in over 20,000 of these homes. Wuna is a village just outside Abuja, but it is an agrarian community, not of course, on the national grid, and had no other source of power. To charge their phones in Wuna Village, an entrepreneur with a small generator runs a service. So, you take your phone to his shop once a day, you pay a small fee for charging. Life in Wuna used to shut down at exactly 7pm until daylight. But working with a PPP model and the government-owned NDPHC, partnered with Azuri technology, a private company to provide a domestic solar solution. So, Azuri had provided the same end-to-end service that is done in East Africa. A solar home system, including a payment system. The Solar equipment cost N1,900 a month to pay. Every home had one mounted on their roof. As I said, the total costs include running it on a daily basis, just N2,000. For the first time in its existence, the village now has running water which is solar powered, the school has power. The school hall is now used as a community hall in the evenings. Each home has 4 points of light. Children can now stay up and do some studying at night. Many of Wuna’s women can also process their millet and yams at night now. New jobs have been created for solar installers, maintenance, and management of the payment system etc. Only one guy has lost his job, that is the phone charger. Every household can, of course, now charge their phones. But on a much larger scale, we have facilitated a private solar power supply to markets across Nigeria, using new extra powered lithium cells. So, we have solar power now in Sabongari market in Kano, in Ariaria market in Aba, in Sura market in Lagos, Isikan in Edo and two other markets in Ondo and Gbagi market in Oyo State. All of these are now economic clusters powered by solar. But also, all private and of course, everyone is happy to pay, everyone is happy and of course, it is so much cheaper than a fuel-powered generator. Algeria, for example, has also created 3,500 jobs in the construction of 14 grid-connected solar PV projects with 700 permanent jobs expected to come into operation once the project is completed. Kenya has built Africa’s largest wind farm at Lake Turkana, providing 310MW of reliable power, low-cost energy and this is put on their national grid. 15% of the country’s installed capacity is solar powered now. Its construction alone created more than 2,000 local jobs. So, there are all manners of opportunities around innovation. Education for us, of course, offers new opportunities for innovation. Our median age is about 18; this means 100million young people are 18 or under. They need to get educated, and at a higher quality than we are delivering today. They also need relevant training for the new opportunities being created by technology and innovation. The only way to deliver education on this scale is through technological innovation that can deliver the best curriculum by the best teachers to the highest number of young people. And there is no other way of doing it on scale, except with technology. We have experimented with how to use technology on scale in this way. With our N-Power programme, we engage 500,000 graduates who work as teachers, extension workers and public health workers. About the first 250,000 of them have tablets and the tablets have a good number of training materials from entrepreneurship to code writing, programming, etc. 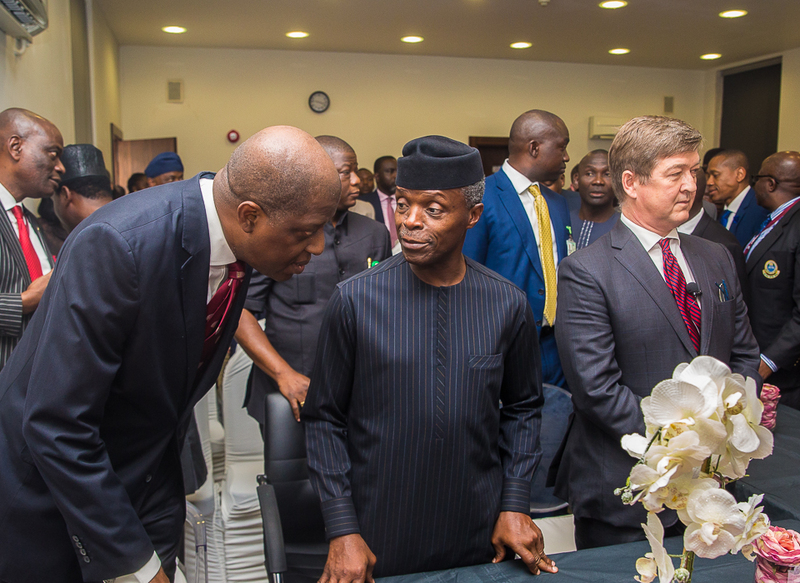 But also, we have an open portal for all of the beneficiaries of the N-Power programme, so they can actually get on the portal and take a lot of the materials they need. But we were also able to do practically everything concerning these 500,000 people online. Particularly from recruiting them, to paying them every month and also to monitor what they’re doing. All of it is done online. So, it is entirely possible for us to train hundreds of thousands of people and we’re adapting this to the training of teachers. We also see that innovation is bringing us so many other advantages. 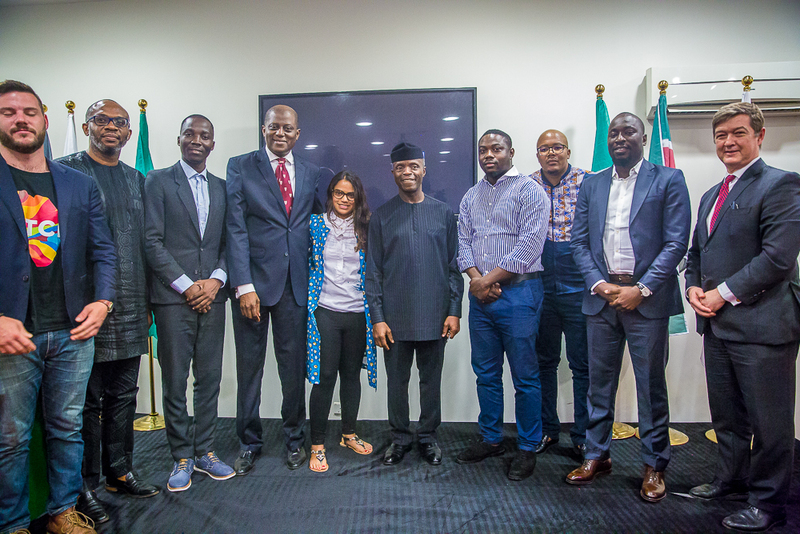 But because technology allows information to be spread to more Nigerians more quickly, we see of course that it is also helping governance, no matter what is said. And I am not talking about computerizing the whole of government facilities or digitalizing it in any way. I am talking more about just holding people more into account. Because now, it is very difficult to do anything without being caught on camera and being posted unto one platform or the other. I think this is a good thing, every day some of us who get practically insulted on Twitter for stuff that you did wrong and many times, stuff you don’t even know anything about. But it is all good. I think It’s better than not being able to hold politicians to account. I am sure there will be a lot of talk on Blockchain technology and this is something that we are already seeing in Nigeria. We have already started innovating in Blockchain technology, especially for financing supply chain in particular. So, we’re already seeing a lot of innovation around that area and Interswitch is already doing quite a bit of work on that. And I have no doubt that the culture of innovation in Africa and Nigeria will be game changer and it is what will make the real difference in meeting the challenges that Africa and indeed Nigeria is faced with, and this is just by looking at what is going on already and paying quite a bit of attention and detail to so many of the different things that are going on everywhere. And I think that there’s no question at all that just given the right environment and given some encouragement, a lot of work we are seeing today, we would see in multiples. And a great deal of the problems we talk about as if we have no solution will be very quickly solved indeed. Finally, let me commend the founders of the Africa Institute for the hard work and sacrifices to get the Institute launched. As you heard, the Africa Institute is dedicated to providing skills development to managers, policymakers, and to leaders in techniques of good governance in the context of the African society. And I am particularly delighted that the Africa Institute has made innovation a core pillar of their approach. 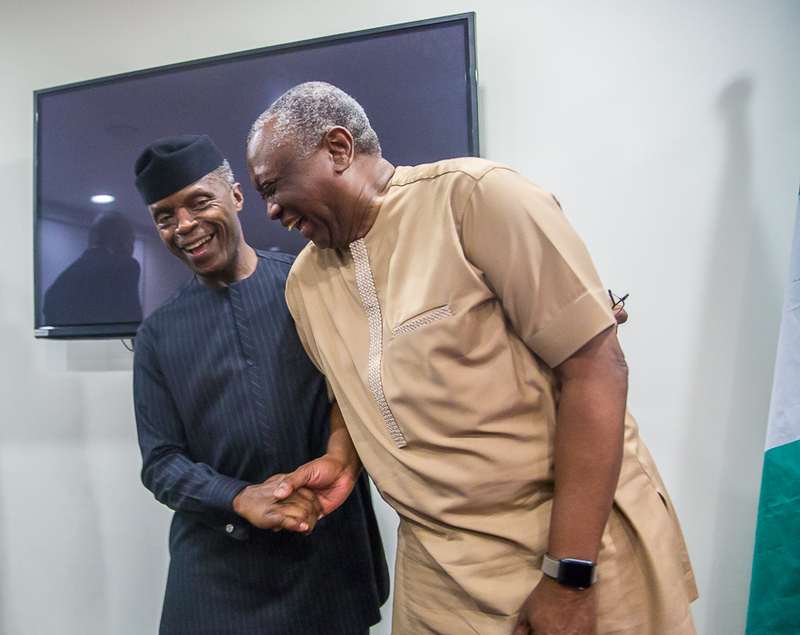 I also understand a second pillar of the Africa Institute is a moral foundation for our public sector leaders, both politicians and civil servants and I would extend that to all private sectors players as well because everyone certainly needs a moral foundation. Innovation and Moral Foundation – two powerful forces that will not just propel Africa forward, but ensure that our progress will endure. Congratulations to the Africa Policy institute, especially Dr Andrew Nevin and Yemi Cardoso on this first of many Calestous Juma gatherings.